Had you ever heard about Split before you decided to visit Croatia ? No. Not the verb!! Being a coastal Mediteranean city, Split city boasts great traditional culture as well while capturing modern influences as well. Split City was under the rule of many empires, including Roman and Austro-Hungarian. Its inevitably reflected on their culture, architecture and mentality. The Old city of Split is one of the oldest in the world, and it is really authentic! Feel like exploring a bit? Beautiful islands like Hvar, Brac, as well as others, are in close proximity. Games of thrones was captured there  So for all you fans out there, you yourself can walk the streets of Meereen and Braavos! All these, plus the fact that the city is less touristy than Dubrovnik (for now) makes it a great destination for your next vacation! Visit old towns because they are really beautiful and atmospheric – this one is THE Old town you need to visit, believe us! Everything is so well preserved and you literally have centuries of interest in one place. The Old town of Split is a UNESCO world heritage and it is such a treasure! It became a UNESCO world heritage in 2014. And because of that, many works have been done there. For instance, they have cleared the main temple with special lasers. And nowadays you will see it as white as it used to be thousands of years ago, wow! In the old town, make sure to visit Diocletian’s palace. It’s a marvelous landmark of the past, and within it’s walls people live their daily lives and keep shops. Don’t miss the cathedral of Saint Dominus. It has a truly impressive history! It is also the best and well preserved temple in Europe! NOTE: Remember that the cathedral bell will ring at every sharp hour. So, if you don’t want to be ringing all day, try not to go up the cathedral on the hour! There is this fantastic overlook on the city from Marjan hill. You have got to see it! Here’s how to get there: from the waterfront (Riva) take the steps up (ask for Marjanske skale). In a maximum 10 minutes you will understand that you have found the spot which we are talking about, as it will take your breath away with its beauty! It will also make you forget about all the efforts that were needed to get there! If you want to enjoy it a bit longer this hidden paradise, there is a nice coffee shop right on the top of the hill. Our walking tour takes in the Marjan Hill – see below. If you want to take a tour of the Old town, the Gecko provides a fully guided and inexpensive tour of the town each day – We strongly recommend it! Your visit to Split will miss out on so much if you don’t take the tour! Our small team is incredibly knowledgeable of everything that concerns Split and Croatia. We ONLY take small groups of 10 people and under and we are the best value walking tour in Split so come and join us. Our fully guided tour lasts approx. 2 hours and we specifically visit the Marjan Hills to give you that great look back over the City of Split. Now, if you are a Games of Thrones fan, it is time to take notes and pay close attention, as we will tell you all about the relevant places in the series during our walking tour! For the more ardent GOT fans we offer a special GOT tour where we visit Klis fortress, the setting of many GOT episodes – see our GOT tour. Our walking tour runs 5x a day starting at 9am for early birds and ending at 7-30 p.m. for a pre dinner stroll in the cool of the evening. For larger groups the Gecko can be flexible to your needs and timings and arrange a private tour. On its own this could lay claim to being one of the top attractions across all the Mediterranean! Split is also famous for its great beaches! 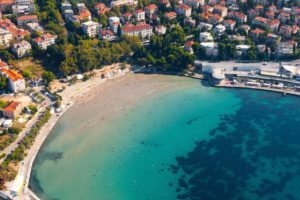 See our blog on four of the of the best beaches in Split. We would be hiding out some priceless info, if I would not tell you about the islands! Marvelous Croatian islands are so close to Split, that it would be a crime not to go visit them for at least a day trip!